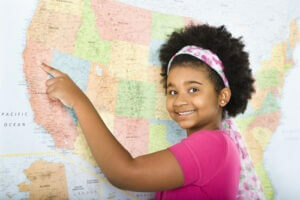 Girl pointing to map of United States and smiling at viewer. Photo courtesy of Shutterstock. The USA is a country with a well-established education system that is proving its efficiency. Here are a few takeaways from the US system of education. The system of education in the United States of America is one which is considered a very successful and efficient one. Where there is always room for improvement and the USA’s education system has its faults, there are a lot of things that can be learnt from it. One of the most notable of the USA’s system of education is the access to education for all children. Education is free in the United States of America, as well as transportation to school. It is compulsory for all children to attend school. Since 1918, all states in the USA require children to complete elementary school. The diversity in education is another very prominent feature of the education system of the United States. There is an extensive variation of options to choose from for students. There is no Ministry of Education. There is a Department of Education, which is a very small federal department, and which does not run schools, universities, or educational institutions. Schools, universities and colleges are independent to choose what they teach and how they teach. The curricula is not dictated by any central body, so each educational institution is free to decide what they will teach and how. There are more than four thousand accredited colleges and universities in the United States of America, and all of them have their own courses and own curricula, which are not regulated or dictated by any central authority, so there is a lot of diversity in the education being offered and the options available to students are vast. An example of how the decentralized system of education makes it possible for educational diversity to exist is the teaching of math and science. Most undergraduate institutions teach these subjects in the traditional way, but there are some institutions which offer programs that dig deeper into the historical roots of these subjects, and teach from historical books like Isaac Newton’s Principia Mathematica and Euclid’s Elements. Flexibility is another significant feature of the USA’s education system, which allows students to choose what they want to study at almost all schools and provides opportunities for them to study across disciplines and conduct interdisciplinary research. Furthermore, students in the USA study up to class 10 a curriculum which enables them to enter any field they want. They do not have to make a choice before that. Even after they have chosen a discipline, they can always choose minors from other disciplines. The opportunity of conducting interdisciplinary research leads to the creation of new fields of study. Schools and colleges in the United States of America give a lot of importance to co-curricular activities. Sports and physical education are considered a significant part of school and college life. Other co-curricular activities like debates, discussion groups, arts and literature events and clubs are also encouraged. These things help develop a healthy and creative mind, and make the students well-rounded. Author Bio: Writing that focuses on various aspects of education by Corrie Williams is published on ordercollegepapers. The topics discussed in her writing include learning and teaching methods, and the incorporation of technology in education.